Permit: NW Forest Pass Required Normally. Special permit on weekend in peak season. There are many combinations of ways to climb Dog Mountain. I will discuss three as are color coded on the above map. The trail leaves the restroom area near the parking lot and immediately begins an extremely steep climb. This part of the hike wanders in and out of forested areas. At about a half mile you will come to the junction of the Orange and Red trails. Bear right and continue to climb northeastward through fairly dense trees and shrubs. In about another mile the trail leaves a dense forested area and breaks out onto a great viewpoint. From here you have outstanding views of the Columbia River Gorge, including Wind Mountain to the west, and the summit of Dog Mountain to the north. Continue on this trail as it re-enters a densely forested area. In about another half mile you will come to the junction of the Orange trail that you turned away from earlier lower on the mountain. At this point both the Red and Orange trails are together during the next half mile. This is probably the steepest part of the entire hike. You will then come to another junction. The Orange hike bears to the left and up the face of the mountain, but the Red hike follows a more gentle approach by switch backing its way through the dense forest on the northeast flank of the mountain. In a little less than a mile you will come out just a bit short of the top. Here you are treated to fantastic views. Also, be aware, that during the last week of May and the first couple weeks of June, Dog Mountain is the ultimate flower garden. The Balsam Root is the main flower that turns the mountain yellow during this period of the year. This option begins at the same location as the Red trail, right beside the restroom near the parking area. At the half mile junction, where the Red trail bears to the right, the Orange Trail continues on straight ahead. This trail is by far the steepest approach to Dog Mtn. The trail is almost entirely in dense forest and at about a mile and a half, it joins the Red trail at what is the steepest part of either hike. A half mile later, the two split again, to follow the Orange Trail, bear a sharp left and follow the trail out in the open and up the very face of the mountain. This approach requires great care that you stay on the trail and do not get anywhere close to the drop offs along the way. People have died by being careless along this stretch of the hike. In about a half mile, after hiking past the cliffy areas, you will come to a junction with the Green Trail. Here the two trails follow the same course to the top of the mountain. The views along this route are exceptional and add great reward to the hike. Now this route up Dog Mountain begins at a different place than the other two. Look for the Augspurger Mountain trail head and begin the Green Trail hike from that point. They are one and the same for the first 2.8 miles. The trail is steep and wanders in and out of heavily forested areas as it climbs up the western flank of Dog Mountain. 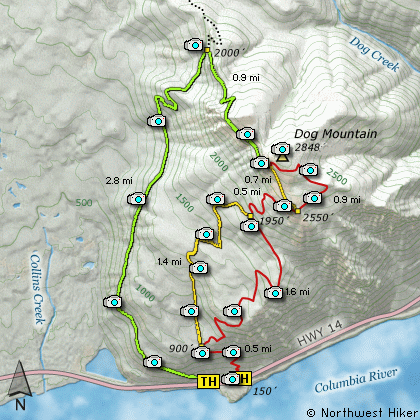 But all in all this is the easiest route up Dog Mountain, and makes a great loop option if you were to choose either the Red Trail or the Orange Trail to return to your vehicle. At the 2.8 mile junction, bear a sharp right and leave the Augspurger Mtn trail and continue on toward the summit of Dog Mountain. The trail switchbacks its was through dense forest for about a half mile, then breaks out onto the south face of Dog Mountain and stays in the open for remainder of the hike. Not only are the views along this route spectacular, but this route experiences the same outstanding, breathe-taking floral displays as the Red and Orange routes. Just about a quarter mile short of the summit the trail joins the Orange Trail to continue on to the top. From Portland, travel east on Interstate Hwy 84 to Exit 44 to Cascade Locks. Exit the freeway and cross over the Columbia River into Washington via the Bridge of the Gods. Then turn right, or east, and head east through Stevenson, Washington to the intersection of the Wind River Highway to Carson, Washington. However, just continue east on SR14 for another 6.2 miles and you will come to the large parking area and trailheads for both the Dog Mountain and Augspurger Mountain hikes. From Vancouver, WA travel east on SR14 through Stevenson, Washington to the intersection of the Wind River Highway to Carson, Washington. However, just continue east on SR14 for another 6.2 miles and you will come to the large parking area and trailheads for both the Dog Mountain and Augspurger Mountain hikes. From either direction, due to overcrowding at the Dog Mountain trailhead in peak season, we highly recommend for safety that you consider using the Skamania County Gorge West End Transit bus . The price is low and the convenience is high.